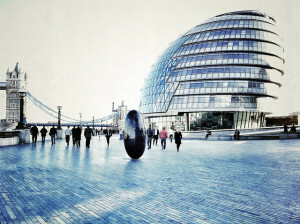 Londonist attended Mayor's Question Time this morning to see how London's budget for 2012-13 is going. There are a few holes that need plugging, which we'll get to in a minute, but the main takeaway from the session was just how mindboggling pathetic behaviour in the Chamber can be. If you thought Prime Minister's Questions was panto-farce, you should get an eyeful of this. which is a direct lift from the Assembly website. So we wonder whether failing to properly scrutinise the budget – which, after all, includes a chunk of our council tax – can be categorised as dereliction of democratic duty. The problem lies with party politics; when a Mayor is allied to a political party, where's the incentive for Assembly members of the same party (and, in this case, the largest constituent group on the Assembly) to point out holes in a policy or document? But we would still expect better than the table-thumping and chants of "four more years" from Tories today, or 'questions' that were simply excuses to permit Boris time to air his election manifesto. We're particularly looking askance at Steve O'Connell, AM for Croydon and Sutton, whose 'question' about the Mayor's "remarkable result" in freezing the police precept prompted gales of laughter from all sides and even Boris took the piss. Whichever Tory AM made a derogatory aside of "oh, the sisterhood" to Dee Doocey and Jenny Jones ought to be ashamed; and Boris shouting over Val Shawcross so she ran out of time was behaviour unworthy of his friendly bumbling image. We could go on, but we're already quite depressed. It's all very disappointing, as there are a number of holes and omissions in the budget that rely on the government promising to stump up the cash between now and publication of the final draft budget on 9 February. There's a shortfall of £85.5m in the MOPC (i.e. the police) budget that Boris hopes the Chancellor will plug and no mention of continuing the RE:NEW and RE:FIT energy efficiency initiatives; again the Mayor hopes Department of Energy and Climate Change will come up with funds. Let's not forget we're also voting for the Assembly on 3 May, not just the Mayor. We'll be back to see if the chamber can manage to grow up before the election, but on this showing it'll probably get worse before it gets better. Photo by Laurabot_ from the Londonist Flickr pool. The archived webcast of today's meeting will be on the London Assembly website shortly.